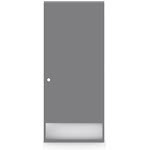 Door protection plates are available in .050" thick brass, stainless steel or aluminum; and 1/8" thick high impact polyethylene in clear or black. All plates, metal and plastic, come standard with four beveled edges and countersunk mounting holes (B-CS). LDW= Less Door Width. When specs call for 2" LDW, deduct 2" from door width to get kickplate width dimension.